Topics: Construction, Design, Thermography, Retrofit, and Safety. 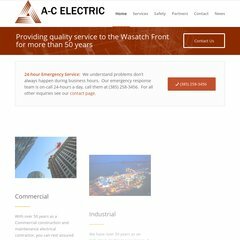 a-celectricinc.com IBEW LOCAL 354 INTERMOUNTAIN CHAPTER , NECA LABOR -MANAGEMENT ..
Its IP Number is 72.52.241.140. Its 2 nameservers are ns1.newworldhosting.com, and ns2.newworldhosting.com. PING (72.52.241.140) 56(84) bytes of data. A time of 18.8 ms, is recorded in a ping test.